Semi-intelligent thoughts on video games and more. Journalism is not obsolete, its morphing. Everyone is a journalist, they just do not know it. 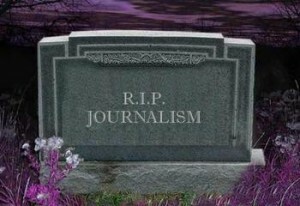 In a fantastic article written by Mathew Ingram on Sep 2, 2011 on gigaom.com titled “Is journalism as we know it becoming obsolete?” the argument that journalism is dead is fought. Ingram’s main argument in this article is that anyone can be and usually is a journalist at least once in their daily lives. Whether that is someone live-tweeting a concert or posting a picture of storm damage on Facebook, they are being journalists at that moment. It can also be argued that when people who are not trained in journalism try to be journalists ethics will be broken. Ingram states that popular newspapers have done worse (sites the News Corp.’s phone hacking incident). If you describe journalism as printed daily newspapers then the argument can be made that it is dying, or becoming obsolete. But journalism is more than that. Journalism is morphing into and interactive environment where readers can instantaneously give feed back to the writer of an article through comment sections in stories on-line. Its also morphing into a place where the “journalist” can directly talk with a viewer over a lifestream. Some examples of this are shows on Twitch.tv like Collin and Greg Live, Up at Noon, and The Attack. These shows have a couple things in common. First they all talk about video games and technology. Second they all have a live chat where viewers can include themselves in the show by asking questions and stating their own opinions of technology news. This is good for journalism. It is making news more interactive and there by making the news more entertaining. Ultimately, this will become the future of journalism. Where readers or viewers will be able to directly influence what is to be talked about. So is journalism becoming obsolete? The answer: absolutely not. Sites like Reddit, Facebook, Twitter, and even Vine are allowing people to participate in spreading news. Journalism is morphing into a more entertaining medium and ultimately will grow into more of a public influenced format.